Spot Gold fell to 2 1/2 week low at $1187 on Tuesday, as traders migrated from riskier assets into US dollar after China announced plans to retaliate on recent US tariff decision. China asks for permission from the WTO to impose trade sanctions on Washington which signals an escalation of persisting trade conflict. Fresh extension lower hit 50% of $1160/$1214 recovery leg, helped by strengthening of bearish momentum and turned falling daily MA's (10/20/30) to bearish configuration. Falling thick hourly cloud capped recovery attempts just before fall (cloud base marks solid barrier at $1195), while descending daily cloud maintains the pressure. 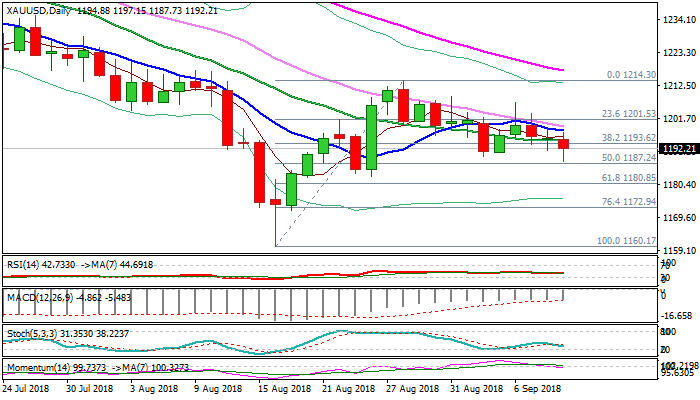 Extension below 04 Sep trough at $1189 is forming failure swing pattern on daily chart, completion of which is needed generate negative signal for extension towards next pivotal supports at $1183/80 (23/24 Aug higher base / Fibo 61.8% of $1160/$1214 upleg). Broken 20SMA ($1194) should limit upticks and keep bearish near-term bias.